An Action command executes an action in the web browser, such as opening a new web page. Most action commands are also container commands, and normally contain the commands that should execute after the web browser action. If, for example, an action command opens a page in a new web browser, the sub-commands will execute in the context of that new web page. Below we summarize each of the configuration tabs for Action commands, and provide links to each of the subtopics. 1.Clicking once on a web element in the browser panel. 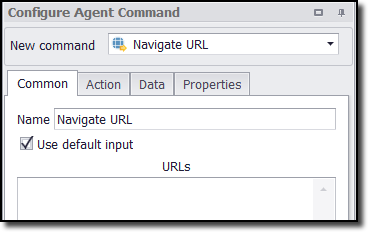 2.Locate the New Command drop-down in the Configure Agent Command. 3.Choose a command from the drop-down. 4.Explore the tabs: Common, Action, Data and Properties. 5.In the Common tab, uncheck the Use default input box to reveal more options. 6.In the Action tab, uncheck the Discover Action box to reveal more options. In many web-scraping scenarios, the default functionality will be quite sufficient. Should you find the need for more flexibility and control, you can learn how to configure all aspects and properties in the Action Configuration section.